Legal news for medical malpractice attorneys – A newly released study on preventative testing for lung cancer found that CT scans pose risk of giving many false-positives, generating invasive secondary looks. 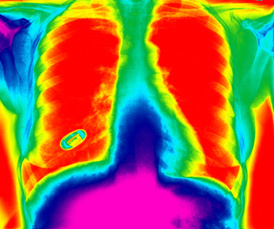 When compared to chest X-rays, CT scans have higher instances of false-positives. New York City, NY (www.NewYorkInjuryNews.com) – The authors of a recently released study titled “Cumulative Incidence of False-Positive Test Results in Lung Cancer Screening” are telling physicians and patients at risk for lung cancer to be aware of the existence of high false-positive rates from CT scans. The study was released Wednesday, April 20, 2010. The study stemmed from the growing rate of direct-to-consumer promotion of lung cancer screening, particularly low-dose computed tomography (CT). According to the study editors, these screenings pose health risks to patients and have not been proven efficient in positively identifying cancer. The objective of the test was to quantify the risk a patient faced during a one or two-year lung cancer screening of receiving at least one false-positive result, as well as the rates of unnecessary diagnostic procedures that followed the false-positives. The study consisted of 3,190 current and former smokers, between the ages of 55 and 74. The participants had a smoking history of 30 pack-years or more and no history of lung cancer. The patients were randomly assigned to low-dose CT or chest radiography with repeated screenings a year later. The smokers then had one more follow up a year later, consisting of three years total. The study conductors used a Kaplan-Meier analysis to find that a person’s cumulative probability of getting one or more false-positive results from CT examinations was 21 percent after one screening and 33 percent after a second. Those that received chest X-rays risked a nine percent chance of receiving a false-positive for the first test and a 15 percent chance after the second. A total of seven percent of participants with a false-positive CT exam resulted in an invasive procedure. Similarly, four percent of those who received false-positive results from X-rays resultantly had an invasive procedure performed. Given the relatively high probability of false-positive low-dose CT lung cancer screening examination, it is important that providers have careful discussions with patients who request this technology to help them weigh known harms against currently theoretical benefits. Further investigation into the physical, psychological, and economic ramifications of false-positive low-dose CT screening test results is warranted. The Lung Screening Study was made possible through awards from the National Cancer Institute. The majority of the authors who designed, analyzed and wrote the study are government employees. Legal News Reporter: Tara Monks – Legal news for medical malpractice lawyers.